There’s something mesmerizing about music boxes, so I definitely understand why people want to collect them. 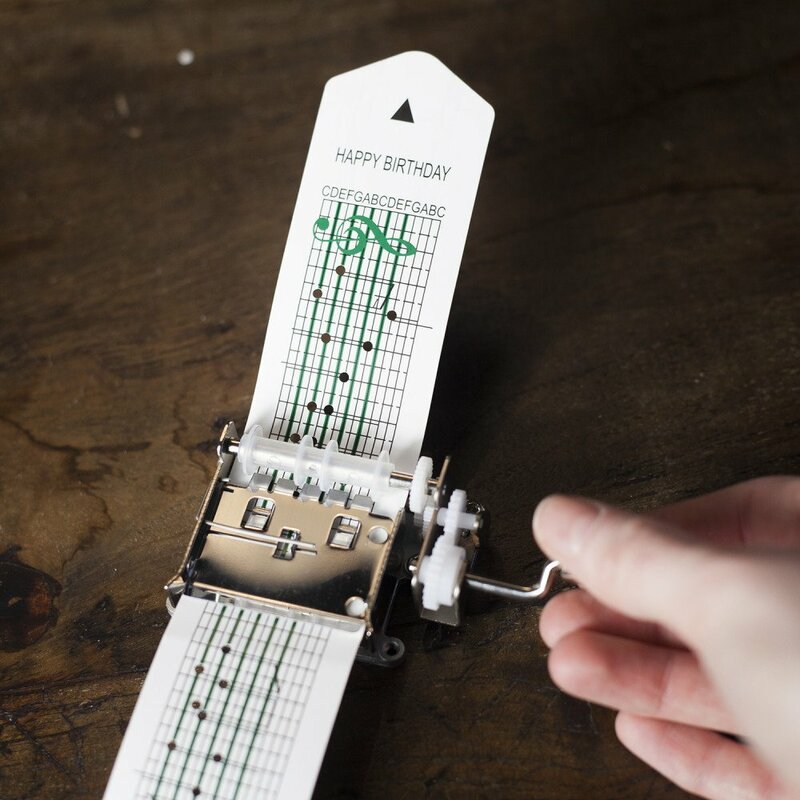 This DIY Music Box Kit by Kikkerland allows you to create your own sheet music that can be played back by a music box. This is especially great for music that want their work to be played back in the most traditional way possible. The Music Box Kit comes with a mechanical music box, that’s easy to assemble and is manually operated with a crank. After putting together the music box, there’s a pre-punched sheet with the happy birthday song that you can already start playing back. In addition you’ll get three blank sheets and a hole puncher. You can create any song in the key of C when you know the right holes to punch. If it takes some trial and error to get to the right melody, note that you can also order a paper sheet refill (of 5 pieces) for relatively cheap. Now, you’ll probably think this kit will go no further than simple nursery rhyme songs like happy birthday. Well, check out this musician that has composed a full album’s worth of songs made with just the Kikkerland Music Box. All in all, this music box kit is a great gift for a beginning musician or music lover that wants a therapeutic way to create sheet music, away from any computer screen. Even better, compose your friend or lover’s favorite song using this kit and then gift the music box and paper sheet altogether, for a unique personal gift. The Kikkerland DIY Music Box Kit is available with most major retailers for under twenty bucks. This includes the 3 empty sheets for you to start. A 5-piece paper refill costs 6 bucks.